Allie’s classes combine hard-work, honesty and fun to create an environment where each student can play with and/or discover their own personal practice. Her goal is to get students – whether beginner or experienced – on their mat, feeling their bodies and focusing on their breath. By linking breath with movement, Allie’s classes help students create an energetic yet calming and meditative practice where students leave saying “that’s exactly what I needed.” She strives to help students build confidence and truth within themselves about their own practice that keeps them coming back to the mat years after. Allie believes that yoga is not just a physical practice, but one that combines the mind and spirit to create a beautiful human from the inside out. 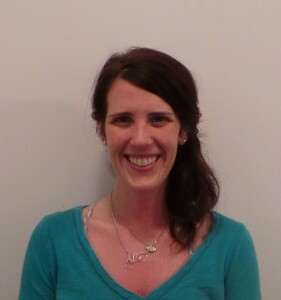 Allie’s yoga journey began over three years ago when she was brought to a yoga class by a co-worker. It only took 60 minutes for Allie to fall in love and know that she wanted to continue learning all she could. She began her yoga journey by taking Hot Vinyasa Flow classes and then found herself expanding and exploring the practices of Iyengar, Ashtanga, Yin and Tantra. She has studied with teachers Lucia Cordeiro Drever, David Duerkop, Noah Maze and Rod Stryker. Allie teaches a gentle slow-flow, Iyengar-inspired yoga practice where her students focus on body alignment and breathe awareness. Her style-motto “you might not break a sweat, but you’re going to feel it in the morning.” Allie’s classes are perfect for beginners who want to know the basics or for the experienced yogi looking to refine their foundation.